Why is EDEA so Special? – Skates U.S.
Why is EDEA so Special? EDEA is lighter than any other figure skating boot due to the new materials and technologies used in the Skates. EDEA Skates are 20% to 32% lighter than other manufacturers “light” boots and up to almost 50% lighter when comparing them to the standard high strength boots. Just think about the extra time in the air to complete or increase your spins. Also with less weight in the skate as a whole, the skater can accelerate faster with their free leg in jumps such as the axel, double axel, or triple axel. The Footbed – The EDEA molded Nylon Fibre Glass Footbed structure integrated into a very simple-looking sole of the Skating Boot performs many functions. The Footbed provides a smooth, well-shaped and well-balanced basis for the foot to stand on. The upper part of the boot is made of materials that wrap around the foot and attach to the underside of the Footbed. The layer used to cover the base is therefore very thin and makes the boot look VERY different. The Footbed is contained inside the wrapped sides of the Boot structure. The Footbed has virtually no rotational torque, but does allow the skater to flex the back of the ball of the foot properly to match the many Ice Blade contours. The Footbed does offer just a very small amount of vertical compression in the engineered honeycomb area at the ball of the foot, which is great for landing jumps and provides comfort when you are wearing your Skates for long periods of time. For Rollers this honeycomb area provides with incredible ventilation and channels for air to move under the foot to help keep the feet cool and dry. For Ice the Footbed provides a waterproof way to mount your Blades. Lower Center of Gravity – Compared to a traditional thick leather sole, the EDEA molded nylon fiberglass Footbed is thinner, creating a lower Center of Gravity and greater Control for the Skater. This lower Center of Gravity creates enhanced sensitivity to the skating surface and wonderful stability, along with quicker changes of edges. The extra Stability is particularly notable when the landing after jumps, as it may help save the skater from a fall. The speed afforded during edge changes are especially noticeable in footwork, and the secure feeling provided in deep Dance edges. Size Consistency – Because the Footbed is molded, there is 100% consistency between our Sizing and the shape of the Footbed. Use the Chart with confidence in choosing the size of ICE Blade to fit your EDEA Skates. For Rollers, the Boot is the constant. While the Chart is a wonderful point of reference, other issues determining Frame size are the type or style of skating and the balance between the levels of Stability and Maneuverability that are directly controlled by the placement or location of the front Axle. Feeling of Control – With EDEA you will really feel a difference the instant you your boots on. You will instantly feel that your foot has control of the boot and also of the ICE or Roller skate under the Boot. One Major difference is that you do not need to lace the boot extra tightly at the top (the top hooks) to make the Skate feel secure. When properly fitted, your foot should not wander and slide around inside the Skating Boot. Because of the incredible foot control experienced by skaters using EDEA Skates, the top can be more open and provides a wonderful feeling due to the of freedom of movement that results. Deeper Edge Leans – The rounded lower edges and tapered shape of the Footbed allow ICE Skaters to perform much Deeper Edge Leans than those possible with most other traditional skating boots. Sometimes the contour of the EDEA Skates requires a smaller length Blade than used on less tapered traditional leather Skating boots. Large Radius of the Heel – Allows a much broader distribution of the weight and torsion, and provides more stability with 50% more surface area in contact with the sole of the Footbed. The Heels on EDEA Skates are interlocked to the sole part of the Footbed and will not come off, but EDEA has added heel screws for extra security. EDEA never wants a heel to come loose. The molded Footbed is made of a nylon fiberglass structure that is resistant to humidity and temperature. Unlike leather soles that absorb moisture, become water-soaked, allow the screws to fall out, and the blades to sink into the sole, the EDEA Footbed soles are waterproof. The EDEA Footbed is covered on the bottom of the sole by waterproof man-made materials like rubber. This means that there is no need to Snow Seal the Blades to the Boots. The Honeycomb sole of the EDEA Footbed will properly take on the shape of most Blades without putting undue stress on the Blade or the Boot. On some of the higher level EDEA models, a Dual Density sole Skin is used. It was developed to help reduce Ice Chatter, the small vibrations experienced when skating on rough ice. This Dual Density sole Skin is an EDEA exclusive. The structure and shape of the Skating Boot is actually formed by a Thermo-formable material (a fusion-bonded, non-woven fabric made from a blend of synthetic fibers). The Anatomic shape ensures a perfect fit without creating pressure points, especially around the Ankle. EDEA is known for its fantastic fitting Heel Pocket and the extent to which it holds the foot in place, even while jumping. The inner padding is designed to provide great comfort, without constraining the freedom of movement required. On some of the top of the range models, a Foam cuff is added for extra protection of the Achilles Tendon. The design of the Skating Boot provides great Lateral support for the foot and vertical strength that helps to protect the Ankle. it also allows the tongue to be bent and avoids the sides of the boot creasing on most models. Due to the secure way in which EDEA Skates holds the Skaters Foot, Skaters will experience a FREEDOM of Movement that has rarely been experienced before. This is a boot that does not have to strangle the leg at the top to provide the skater with strength and stability. 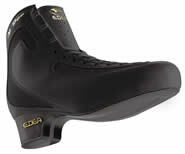 The profile of the EDEA boot has been designed to utilize the full range of motion available to the ankle for the propulsion on the run-up to jumps and to allow the skater to fully point his toes, ensuring a much more fluid, elegant skating style. For Rollers the honeycomb of the Footbed provides incredible ventilation and channels for air to move under the foot to help keep the feet cool and dry. Depending on the different models, some use Indirect Ventilation, while others use Direct Ventilation. Indirect Ventilation – is obtained by opening the exterior vents under the Heel of the boot, fresh air blows through the Heel all the way to the front of the boot. Direct Ventilation – is used on some Roller models. The Footbed is fully ventilated on the bottom. On the FLY there is also Ventilation on the upper sections of the boot and tongue also. 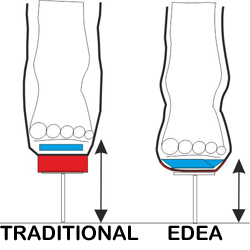 The MicroFibre Linings of EDEA Skates wick the perspiration away from the Skaters foot while skating and then allow that moisture to rapidly evaporate from the Skate to dry. Allowing the moisture to stay in the padding of the boot is what rots the padding in some skates and allows the skate to become uncontrollable and start hurting the feet. The MicroFibre Lining of the ICE FLY is the new Air Tech for fast drying, while the Concerto uses the strong and fast drying perforated Lorica (feels like Leather) MicroFibre Lining. All of the MicroFibre linings are Antibacterial. The best feature of EDEA boots is the fact that they can be Custom Shaped by manipulating (Shaping) the Thermo-formable material used in the structure, creating a Custom Skate that is based on a Standard Boot. “INSTANT CUSTOM Skates“. All EDEA Boots are available in 4 different widths: B (narrow), C (standard), D (large), E (extra large). The C width is always in stock, while the other are available upon request. EDEA has developed an incredibly comfortable Shoe Last to build their boots on, and this seems to fit many if not most Skaters very well, without any modifications. But, because of the Thermo-formable material used in the structure as the structure of the Boot, ALL of the EDEA boots can be Custom Shaped and Modified in width. The heels can also be tightened or opened and many other adjustments can be Custom Shaped into the boot. Once the Boot has been shaped, it will stay in that shape until it is changed again. Shaping can be done to allow for Square toes, Hammer Toes, Bunions, High or Low Arches, narrow heels and ultra narrow Achilles tendon along with the many other shapes that feet can take.Our idea is to take a stock boot and customize it to suit the Skater, so avoiding having him pay the cost of a Custom Boot. This technology is far superior to that of Heat Molding (which in many cases requires periodic re-heating), using the traditional OVEN, that is heating the padding so that it will form to the Skaters foot. With EDEA Skates, the internal padding is Memory Foam, similar to what is in a Mattress and only needs body heat to shape to the foot. When the Skates are “SHAPED”, the actual structure of the Skating Boot is being custom modified. DO NOT put EDEA Skates in an OVEN and heat the entire boot, as this would soften the entire structure and shape of the Boot. We strongly advise against this. We use Hair Dryers, Shoe Lasts and other special tools to Heat and Custom Shape the specific areas of the Structure of the Skating Boot that need to be modified. While this may not incredibly difficult, it does however require a good knowledge of Skating, the Boots and how a Skaters feet work inside of them. EDEA has created this Incredible and truly wonderful breakthrough for the Skating World, “INSTANT CUSTOM Skates”. The use of forged hooks that are sewn in, not riveted. Utilizing forged hooks that are sewn in, not riveted, EDEA has designed a unique new Forged Steel Hook system that is superior to the Riveted Hooks present on most Skates. The Hooks are sewn into the front edge of the EDEA Skating Boot, providing a superior rounded envelope closure and ensuring that pressure is applied more evenly. These hooks are double depth so laces can be wrapped around each Hook twice. Even the EDEA Laces are special. They are exceptionally strong with very little stretch because of the special blend of Nylon, Polyester, and Cotton. These laces, in combination with the Outside-In Lacing method, actually locks each loop through the eyelets in place to keep the laces from loosening up on their own. The ability to individually control the tension of each loop is extremely positive. Due to the New Technologies employed in EDEA Skates, the Break-In period is extremely short, usually just one good workout is enough. During the Break-In period your feet are training the Memory Foam to fit the shape of your feet and the Tongue must learn to bend and provide the resistance needed to make you feel secure. The anatomically-shaped structure is extremely flexible in order to support your feet and simultaneously adapt to your skating style. Once standard leather boots,and finally feel good, the leather continues to stretch and change. EDEA Skates feel incredibly comfortable right away and will continue to feel that way for a long time. Designed for use in plastic materials, these screw are the latest version of self-tapping screws, on terms of research and performance. While the self-tapping screw has a single thread, the HI-LO SCREW has 2 threads. The larger thread is DOUBLE the height of that of the elf-tapping screw and runs at a 30 degree angle (compared to the 60 degree angle of its self-tapping counterpart). The smaller thread has a height and angle hat is similar to that of the self-tapping screw. The distance between the thread is almost double that present in on the self-tapping screw. These elements allow the Hi-Lo screw to incorporate the TEAR RESISTANCE LEVEL. The length of the screw corresponds exactly to the total thickness of the insole and blade combined, so it is important to perforate without slanting. The screw holds throughout the material. The screws are not tipped so the athlete must perforate the sole before fitting them. More importantly, the do not cause discomfort to the foot when fitted. Made of lightweight, innovative materials, they screw in fast and do not rust. 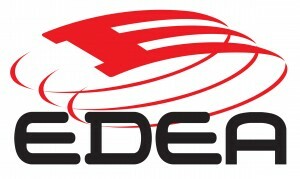 EDEA brings bold new Skate designs to the Skating World. With EDEA you may actually want the judges to judge you on your Skates! Boot covers are not required. And don’t forget those well-placed Swarovski crystals! What a statement! 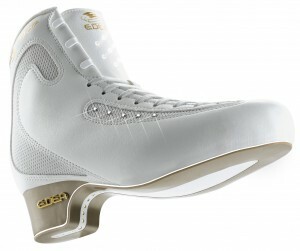 EDEA Skates are competitively priced to other traditional high level Skating Boots. We have a large inventory available for immediate deliveries. We put passion into our work, for the initial prototype design until the last steps of the production process. All our procedures, from the choice of our raw materials to the various operations involved in the creation of the boot itself, are performed in Italy at our factory with our traditional family passion. We stand out because we constantly seek style and elegance, two factors that in turn make our skaters stand out when they wear EDEA boots. Style, technique and the other requirements that are crucial to skaters far and wide are in constant evolution. We strive to meet these new requirements and demands and this, together with our desire to measure our products with those of the competition, is why we are directly and indirectly present at various skating championships and events. These provide use with an opportunity to hear what the end user has to say about our products, and most of all to promote our range.